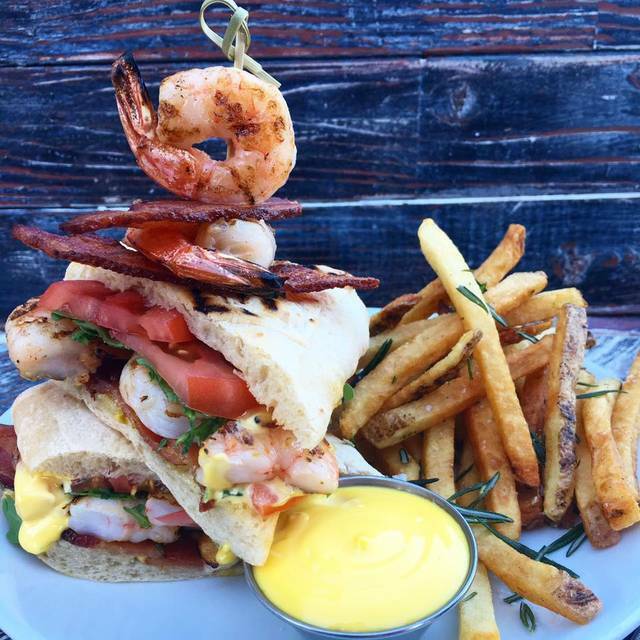 You must make reservations at least 5 minutes in advance of the time at George Bistro + Bar. AN ECLECTIC BISTRO WITH CONTAGIOUS ENERGY Curated from the personal experiences of Chef George Lazi, George Artisan brings the best of the South of France to the American South in Pensacola, by way of Manhattan. COMFORTING FAVORITES. SURPRISING DISCOVERIES. From the early morning hours to the last glimpses of the evening, George serves food that focuses on the simplicity and freshness of the ingredients. Our breakfast offerings are both sweet and savory, and our lunches consist of the freshest salads and sandwiches. The atmosphere changes as the candles are lit for dinner. Choose among our Sharing Plates or local favorite entrées such as our Fruits de Mer Squid Ink Spaghetti. On the weekends, the focus turns to brunch in a fun and energetic atmosphere with short rib hash and smoked salmon poached eggs that are perfect with signature mimosas and cocktails, like our Champagne Pop. *Consuming raw or undercooked meats, poultry, seafood, shellfish, or eggs may increase your risk of foodbourne illness, especially if you have a medical condition. Extra dressings and sauces are 25 cents each. I brought my wife here for dinner on her birthday, and we had an amazing meal. My grouper special was one of the best grouper entrées that I have ever had. Our service and the atmosphere were excellent. We enjoyed it so much we came back the following day for their Sunday brunch, and it was likewise excellent. Highly recommend! Excellent brunch at George’s. Our service by Christine was just fantastic. Our food was served very promptly, hot and wonderful. We brought 3 people with us that had never been here and they really enjoyed there time. We also ordered watermelon mimosas they made fresh and just perfect. Well done. Also we made reservations with opentable and that was a big plus for our experience. Lovely evening on the porch at George with our dog. 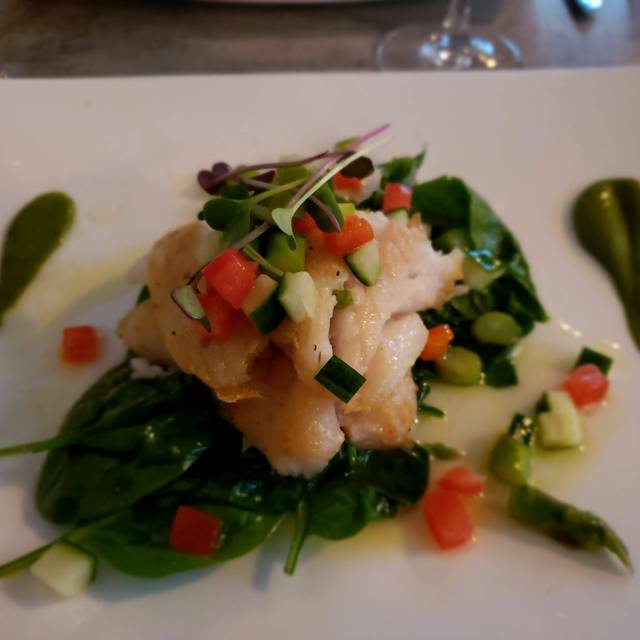 Excellent service and fresh, creative delicious food. The George fries are decadent and wonderful. I can rarely pass on the salmon entree---fabulous! The large parking lot was filled . . . so happy to see this restaurant thriving in this part of town. Wonderful service with a unique cocktail menu as well as delicious food with a distinctive flair! The food was amazing. Had the filet and chicken so yummy. Cameron was our server, he was professional and great at knowing the menu. He knew the specials and did well dealing with a custom home didn’t remember his name at first. Great Aryana wonderful time. I suggest you try it if you haven’t already. The food is always amazing. I've never had anything I didn't absolutely love! I'd recommend George's. The food is good. Servers can be pushy with add-ons and prices are on the high side; especially for the location of the restaurant. Overall a good experience with room for improvement. I wanted to really like this restaurant. The service was excellent. The atmosphere was nice but I was not impressed with the food. I ordered the quiche and was disappointed. The quiche from panara bread is much better. I expected more. Stopped by for a bite to eat, too late for lunch too early for dinner went somewhere else for a drink and came back for dinner had delightful time eating and chatting with bar tender. Really enjoy going to George and planning on a brunch soon. My fave place in Pensacola! Love coming here. Absolutely wonderful experience at George Bistro + Bar! Excellent food and service. I will definitely be back. Keep playing music. Our Waiter George was OUTSTANDING. There were 4 of us in for an early dinner. None of us had been there before. The eggplant appetizer was delicious, the Pastrami sandwich and truffle fries were wonderful. Ended with tiramisu and Peanut Butter Blossom both of which were perfect. Can’t wait to go back! Roasted chicken with kale side was very good, especially the kale but a little pricey. Seafood salad also very good. time we walked through the front entrance. We love it here! Best brunch in Pensacola by FAR! (and we brunch every Sunday!) . Always top notch service, beautiful plating as well as delicious flavors all around. We will be back soon! I have only 4 words for you to remember: Get the short ribs! Honestly, they are amazing, I'd say fall off the bone tender, but they already did! 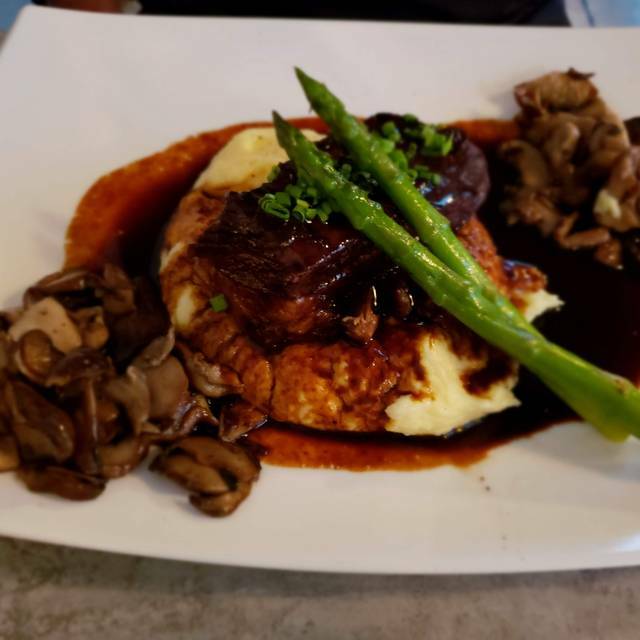 Served over creamy mash with a demi-glace, yum! Our server, Lara, was very conversant with the menu and wine list so she was able to make some recommendations for us. She was attentive without hovering so we had an enjoyable dining experience. We'll definitely be back, I might try the roast chicken next time which looked delicious as it was served to a nearby table. It was our first time being at the restaurant, everything from the greeting we received at the door until we received the check was perfect. The staff was excellent, they made us feel welcome. We definitely will be going back. Food and service was excellent. It was a very enjoyable experience. We will return. Wonderful experience at George as always. We shared the charcuterie board, and ordered the Shrimp Alfredo and the Kale and Quinoa salad with salmon. The Alfredo was phenomenal and the salad wonderful as always! Others at our table ordered the lobster rolls and the burger. Everything was delicious! Awesomeness! Our very favorite restaurant in Pensacola! We loved the dinner, the chef was amazing! My wife had the ribs, and I the chicken. We had the pear gorgonzola tart as an appetizer which was a wonderful very subtle in flavor start to the meal. The winner in my view was the kale with garlic and nuts which filled my taste buds with joy in every bite. The coffee was excellent and the peanut butter bliss was the top of the ladder for a shared desert. This is definitely the best restaurant in Pensacola!!!! Plenty of choices, best in service, food was made fresh and served hot. My wife and I both had clean plates when finished. We live in Orange Beach, 1 hour away, well worth the drive. Oh yea, we Couldn’t decide on which item to start, so they they sent us home with the Pear dish we did not choose so we could try it. They also gave us a bread pudding to go for our anniversary, 1st. Lass all the way. Enjoy. 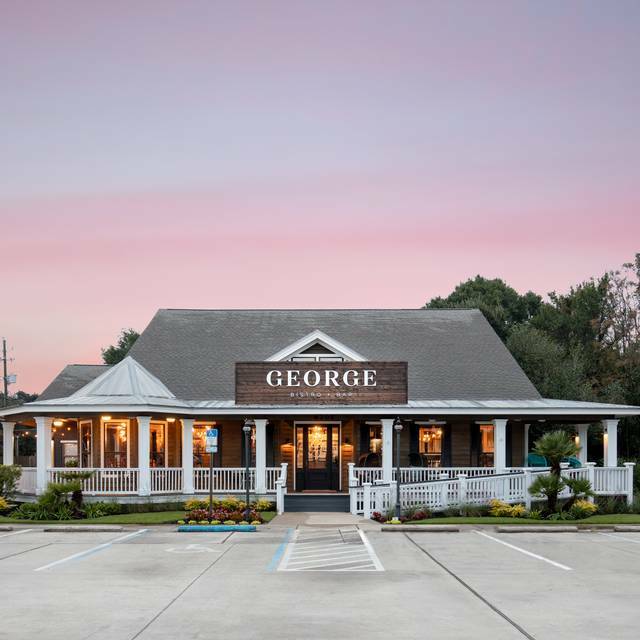 I’ve always had great service and great food at George. We’ve had a couple meetings here and have had good experiences each time. Definitely recommend! Great food great service! Brunch was fantast! We have done dinner here as well and it was superb! Excellent service and excellent food. The food has gotten better since we visited two month. From the inventive starter special of flash-fried artichoke hearts with a highly addictive dill-jalapeno cream dip, to the most delicious shrimp and grits (jumbo shrimp cooked to perfection, diced andouille sausage, parmesan shaved over creamy grits), to a (flawless) braised short rib with mashed potatoes, grilled asparagus and cremini mushrooms...our only regret was not saving room for dessert. When we jokingly told our server we were going to have to pass our plates back and forth so we could taste everything, she had the chef split both entrees in half so that we each had our own portions...which were still nearly too large to finish. But we persevered! Service, ambiance, wine list, cocktails, coffee and OMG the food. I just cannot say enough good things about this outstanding place. Best brunch in town at reasonable prices. Perfect place to be on a Saturday morning or afternoon. Filet Mignon special was one of the best steaks we have ever eaten and Roger was great as always. Another “spot on” meal at George! This place is absolutely fabulous. There is ingenuity with each dish, attention to detail with all things and the wine/drink menu is above average- by Pensacola standards. In New Orleans, it would be a big hit. We come back here nearly every time we visit Pensacola -which is often. Excellent dining experience. Nice casual setting with delicious, well presented food. Our way, Nadine, was very knowledgeable and offered sincere recommendations. Our party of six had all the attention and service we needed and then some. The service was impeccable. We did Sunday brunch. The menu was quite extensive. 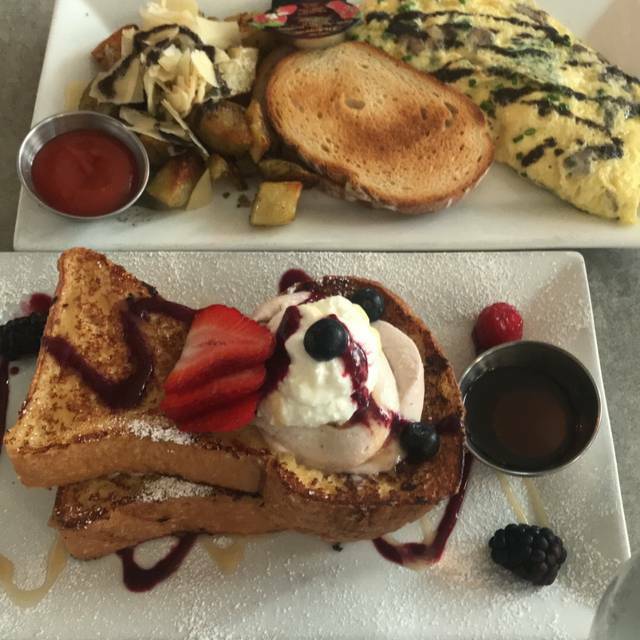 I had the berry French toast and my husband had the truffle mushroom omelet. Both were large servings and absolutely delicious! The mimosa and bloody Mary were well made. It is not cheap but the quality and quantity of the food make it well worth it. We will definitely go back! We love coming to George (both in the old location and the new place). This was our first time for dinner. Food and service were excellent. Really like the decor of the new place. Our only request is for more sound dampener panels. Having a nice conversation is hard to do because of the noise level. Excellent food and service. Very loud inside. Absolutely a great meal! 4 people 3 different meals. All of them were amazing! Presentation was beautiful! Service was so good and she was very helpful with the menu and specials. Will be back for sure! We selected George Bistro due to a previous reviewer's note that it was a quiet restaurant since the occasion was my honey's 75th birthday. It would be nice if there was a room for such. To be honest, we could hardly wait to leave due to the extremely loud noise level. If we hadn't made reservations days in advance, we would likely have left and gone elsewhere. That's even after we asked the host for a quiet corner. Food was tasty but I would have preferred the chicken to have been cooked a little more since the bones did not pull apart easily. The bread pudding was next to divine. Our waiter, Roger, was attentive. At this time, it's uncertain if we will return. If you enjoy having to talk over the noise to converse, then you will be happy with this establishment. The food is of superb quality! We even bought a gift card for friends as we were leaving.